Yea! We’re sponsoring a workshop! Should be pretty interesting. Hope you can make it! This workshop furnishes the practicing archivist with skills to identify, assess, and preserve history caught on film. Regard future acquisitions of film with confidence and a positive attitude. Who should attend? Anyone who wants introductory experience with and knowledge of film materials. Snowden Becker is a co-founder of the Center for Home Movies and the international Home Movie Day event. 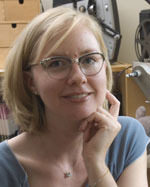 Along with her colleague Katie Trainor, she leads the “Becoming a Film-Friendly Archivist” workshop for the Society of American Archivists. Her doctoral studies at UT’s School of Information are generously supported by fellowships from IMLS and the Donald and Sibyl Harrington Foundation. Ms. Becker will be in Colorado to assess and preserve the 16mm film collection at the American Alpine Club. This project has been generously supported by AAC Board Member Travis Spitzer and by Robert David of The Cinema Lab, Englewood, CO.